Rogue Valley Messenger: What is a common reaction from kids on their first visit to the farm? Melina Barker: Rogue Valley Farm to School got it’s start on one local farm offering opportunities for students to come and immerse themselves in a true field to table experience, tending the fields, harvesting fruits and vegetables, and preparing a farm-fresh lunch. This experience never ceases to inspire and amaze any attendee. They quickly learn how different and diverse farms can be. RVM: Are they surprised that carrots come from the ground? Or, are most kids already pretty aware about how food grows? MB: It depends on the group, however while some students (and parents) are surprised to see a carrot emerge from the ground, nearly every visitor is surprised to see what it looks like when a broccoli plant produces seed, or learn that kale flowers taste delicious. Visiting a farm or garden allows everyone to become a food adventurer, discovering complexities to even the most common fruits and vegetables. It is through this sense of wonder that we can more deeply appreciate and connect with the systems that nourish and sustain us. RVM: Can you describe Rogue Valley Farm to School’s partnerships with local farms? MB: While RVF2S started at one local farm, we now have partnerships with four (soon to be five) local farms that welcome RVF2S educators and students throughout the valley to come connect more with local agriculture. Currently, we partner with SOU Farm in Ashland, Wandering Roots Farm in Gold Hill, White Oak Farm in Williams, Willow-Witt Ranch in Ashland, and will soon be working with Hanley Farm in Central Point. All farms offer a unique experience for students. It’s important to RVF2S to work with local producers as opposed to creating a demonstration farm as some Farm to School organizations do. We think connecting students and families with producers they will see at farmers’ market, listed on restaurant menus, or offering CSA programs provides a true education about our local food system and fosters relationships that support students and farmers both. 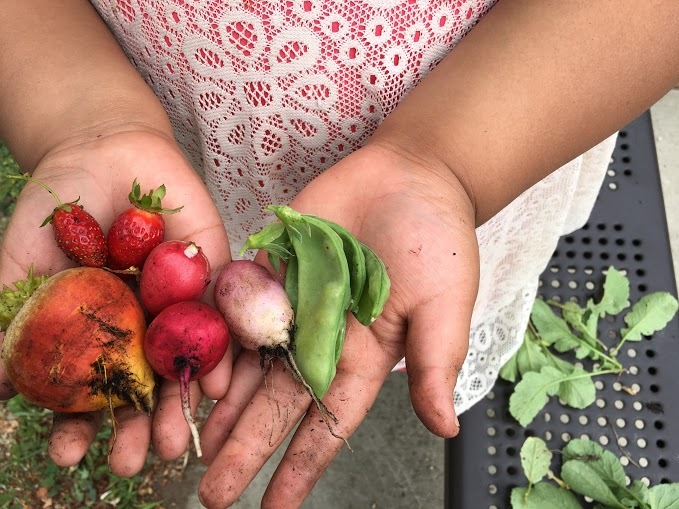 RVM: For the past year, Rogue Valley Farm to School has been working with the Central Point School District to “dig deeper.” Can you explain how gardening can tie into traditional curriculum? And what results are you seeing? MB: RVF2S piloted our “Digging Deeper” School Partnership program with a two-year grant from Jackson Care Connect. This program integrates school garden education, classroom lessons, farm field trips and cafeteria programs for a holistic food-based education. Since the initial pilot program, RVF2S has increased the schools served and now operates in all five elementary schools in the Central Point School District #6 as well as at Kid Unlimited Academy in Medford and Walker Elementary in Ashland. Each school selects one or two grade levels to receive in-depth food education. RVF2S staff work with teachers during professional learning community time to connect classroom subjects to garden and cooking projects. The garden or farm is a wonderful classroom and help bring nearly any subject to life, offering authentic applications for science, social studies, language arts, math and more. Currently we are connecting math to seed-saving projects in the garden as well as cooking activities. Students are designing and building garden elements that solve problems and improve production. We regularly see students who may not be engaged in the classroom taking on leadership roles in the garden and fostering cooperative relationships with classmates. RVM: If you were a vegetable, what would you be? MB: I think I might be a beet. They grow well all year long, come in different colors, and are sweet and hearty. RVM: What is your favorite fruit? MB: In my opinion nothing is better than a ripe summer peach.